Arrrrr! Today's nails were meant to be nautical themed but now that I'm writing this post all I can think of are pirates! I guess these nails are like what a fancy pirate would wear on their day off while they pretended to be just another sailor? ... I don't know. I don't even know what I'm talking about right now. Haha. Enough talk, let's look more at these nails (yo-ho!). 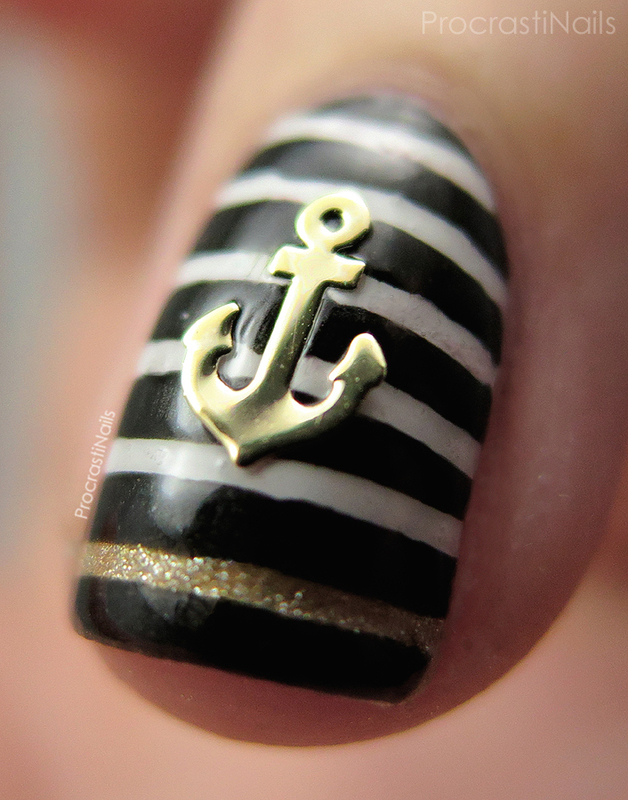 I used three polishes to get this look, along with some striping tape and some anchor charms from Born Pretty Store. The polishes were: OPI Love.Angel.Music.Baby., OPI Queen of the Road, and Wet n Wild French White Creme. The decals are gorgeous and really added an extra something to the look! When I first applied them (by sticking them on my wet top coat) I was worried that the edges wouldn't lay flat enough against the nail, but as you can see from these pictures I didn't have much to worry about. They do still stick up a little bit but I think an extra coat or two of top coat on top would help to smooth it all out. If you're interested you can pick up these charms right now in a bag of 50 pieces for $3.19 from Born Pretty Store, and you can also check out their other nail art accessories and tools. And if you want you can use my discount code for 10% off: ASZW10! 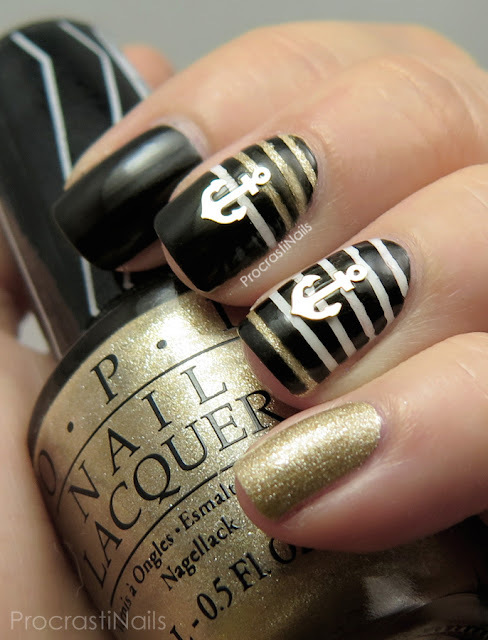 What do you think: would you call these more of a nautical look or do they remind you of pirates like they do for me? Lol at the pirate pretending to be a sailor! I love these though, great colors together! I love nautical - themed nail art! Love the color combo! 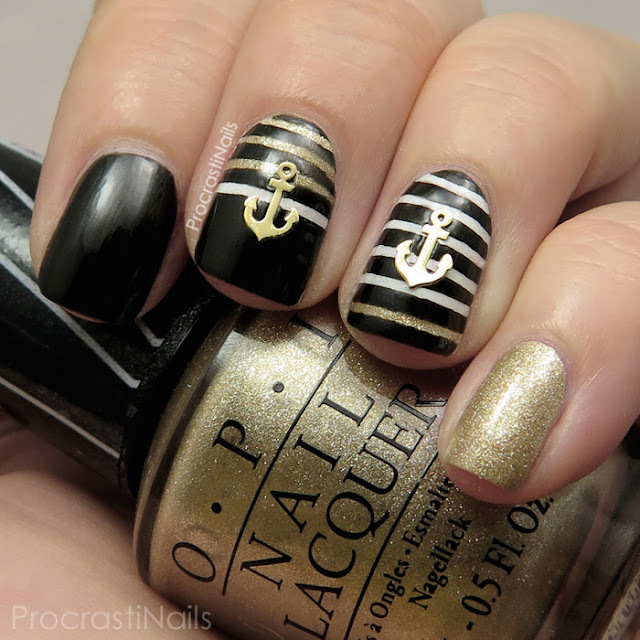 I love nautical themed manis and this one is definitely pirate-ish if that's even a word! These are so adorable! I love the accents of LAMB on the nails with the stripes, it's one of my favorite polishes for accent nails. Hahaha pirates pretending to be sailors! Too funny!